The Nashville Ballet, together with the Nashville Chamber Orchestra, presents The Bell Witch, featuring "sets" by Gerald Marks that are actually digital 3-D projections. 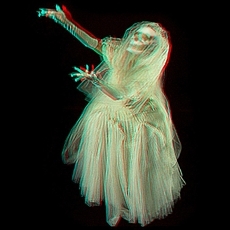 The pictures require anaglyph 3-D glasses for true stereoscopic viewing. You need a red lens over the left eye and a blue/green lens on the right. I design and manufacture all kinds of 3-D glasses (20,000,000 + to date) If you send me a stamped self addressed envelope, I'll be happy to send you a pair.